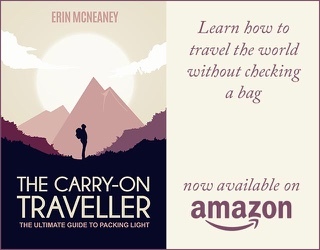 Regina and I follow a lot of travel blogs of nomads like us that roam the world. Most of them have been to South America and have been to just about every country EXCEPT Paraguay. Unless you are from there (like me) or have family, friends, ancient relatives you want to catch up with, Paraguay in and of itself does not have that great of an appeal. At least not until you start researching the small landlocked country. 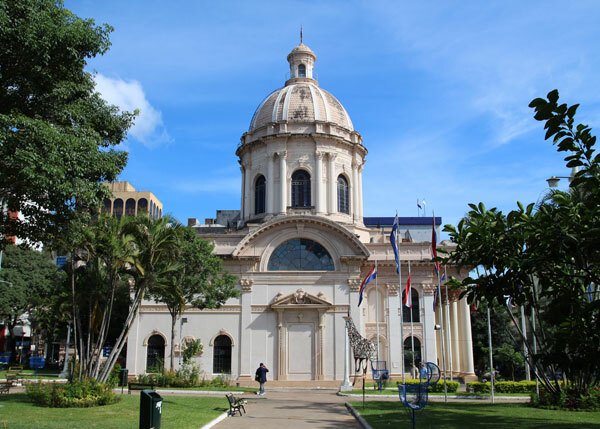 Pantheon de los Heroes – a guarded memorial in Asuncion, Paraguay! As hinted at before, I was born in Loma Plata, Paraguay and my first 2 years of schooling took place there. After that my family uprooted and moved to Bolivia. Needless to say, I still have a lot of memories from that time (now 22 years ago). Although I never cared much to go back to visit, it was just one of the things on my to do list – mainly because my dad moved back there some 10 years ago and I hadn’t kept in touch with him since. At the beginning of this year Regina and I decided we should go on a short vacation before our baby was born. We first considered Mexico, then Cuba, but neither country felt right to me at the time. Not sure what it was, but I somehow could not see us going to either country for that getaway. One Problem: A Thousand Relatives! Growing up in a close-knit German/Mennonite colony where people multiply a dozen times in their lifetime, I have a ton of distant cousins, old family friends, etc that would expect us to spend a day with them. As nice a gesture as that may be – it wasn’t the kind of get-away Regina and I had in mind. Rumors in such closed off communities travel faster than the speed of light. Meaning – if we wanted a peaceful get-away, we had to keep the whole “mission” to ourselves. Which is exactly what we did. After landing in Asuncion, Paraguay (the capital), we spent a couple days in the city – mainly just relaxing but also did a bit of exploring. 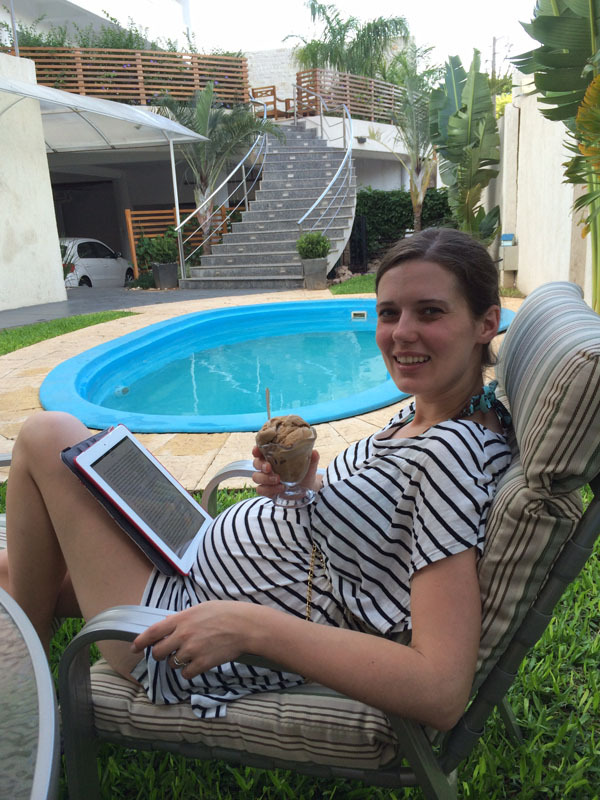 Regina (5 and half months pregnant) relaxing at the pool in Asuncion, Paraguay! Visiting the zoo was one of the things I was super excited to do as I had some good childhood memories of visiting there with my family. Not much had changed – which was surreal and cool at the same time. They still had the mummified woman that I remember seeing back then already, still had a hippo that us kids were fascinated with back in the day, and there still was a Paraguayan native granny selling her arts that I remember my dad buying a hand-crafted bow and arrows from (for my brother and I) when we were there (approximately 23 years ago). 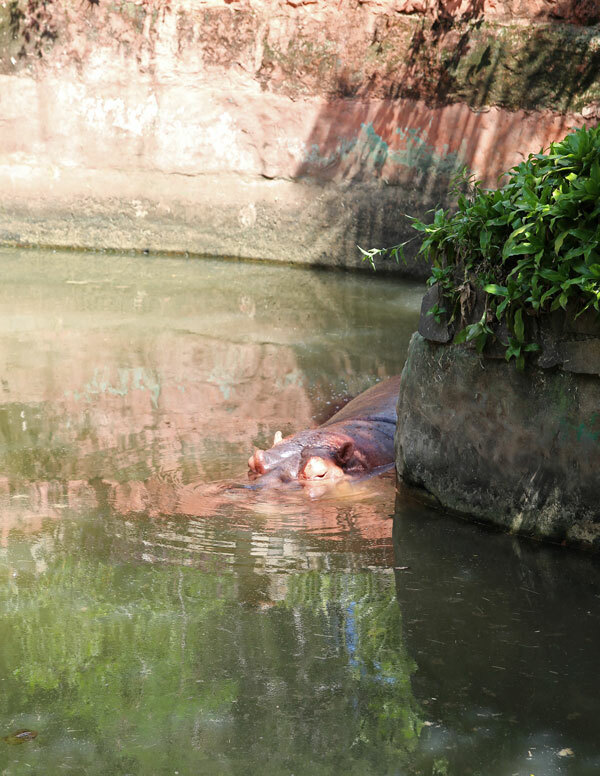 Hippopotamus at the Zoo in Asuncion, Paraguay! We also visited other historic sites in Asuncion but I’ll talk about that in another post down the road. Same goes for our explorations of Loma Plata – the small Mennonite town – where nothing was the same as what I remembered it being 22 years ago. Once we were rested up in Asuncion, we took the bus from Asuncion to Loma Plata to pay my dad a surprise visit. The bus ride is about 8 hours long and cost approximately $15 USD (70,000 Guarani) per person. It goes straight from the bus terminal in Asuncion to the heart of Loma Plata. More info here! While there, we spent a couple days with my dad and with a cousin of mine I had stayed in touch with over the years. Aside from the Chaco being insanely hot (+40°C), we had a great time. After I had satisfied my curiosity of what the Chaco I left 22 years ago looked like now, we boarded the bus late at night and headed back to Asuncion. Once there, we did some more sight-seeing – spent some time relaxing at the pool – did a little shopping, and then headed back home to Canada. 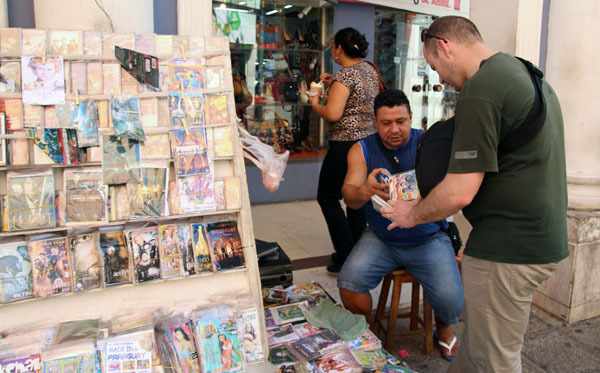 Me buying Paraguayan Harp music in Asuncion, Paraguay! My family was pretty unforgiving that we hadn’t told them about this “secret” get-away, but it wasn’t our problem at the end of the day. It was our vacation after all, and hence we were doing it by our rules! I wouldn’t encourage anyone to be rebellious, but I will say: There was something satisfying about sneaking in and out of a country with no one – except for the people we wanted to know – knowing we were there. Of course this would have been different if the circumstances had been different too – but no regrets. I would do it again if the situation called for it, lol! What is the craziest sneak away you have ever done? Did it involve dropping into a God-forsaken country thousands of miles away?